Yesterday, these were just buds. 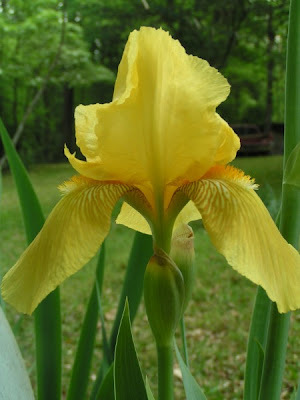 This morning I pulled up my shades and looked outside, and three flowers had bloomed overnight. God's creation is simply amazing. 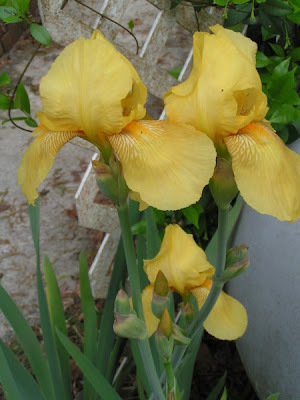 The irises started out in your yard, Miriam, since your mom shared bulbs with us ! Praise God ! The ample rains of the winter season soaked in to make everything healthy and beautiful this year. Reminds me of "soaking" in God's Word through the seasons of life and, in His time, seeing a beautiful harvest of peace, joy, love, and the beauty of righteousness for Jesus' Glory. Halleu Yah !